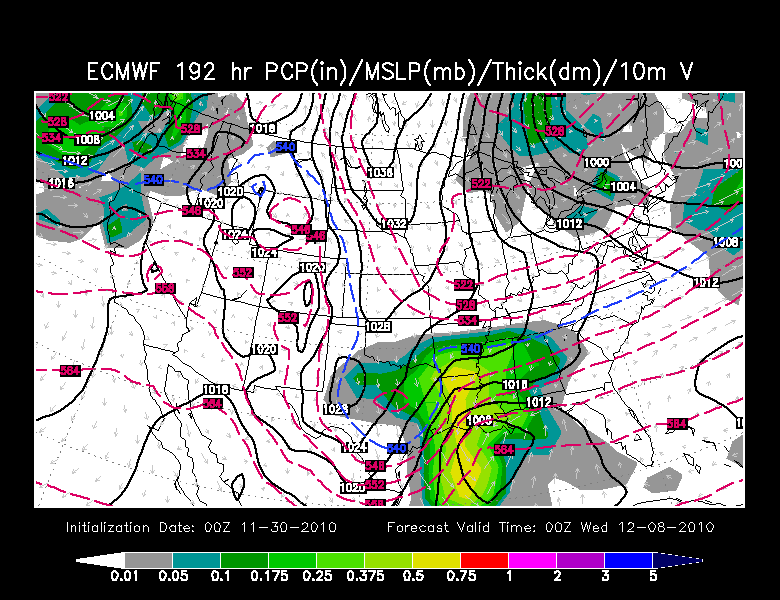 I am looking over the models again this morning to see if there is any hope in our December 7-9 storm. I say "hope" because I wouldn't mind seeing a snowstorm. They are fun for meteorologists! 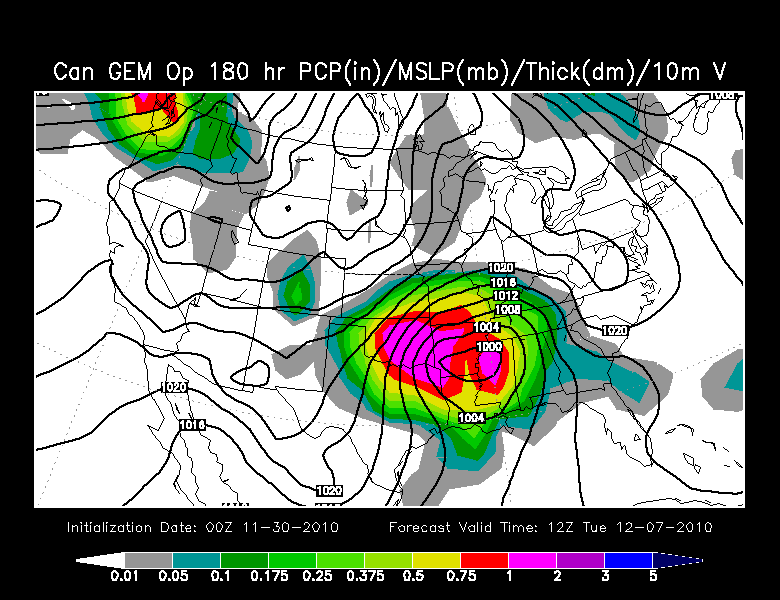 Models are not in agreement as to what the weather pattern will be like for the above mentioned time frame. The NWS's GFS continues to show nothing developing for the time period in question. However, the European forecast agency's model and now the Canadian forecast agency's model (both from last night's 0z run) are hinting at a storm developing. Let's take a closer look. Here is the 192 hour chart from the European model depicting 6pm Tuesday, December 7. The Euro continues to indicate an area of low pressure down along the Gulf Coast moving east. North of the low precipitation spreads all the way to I-40 in Arkansas and Tennessee. This would bring precipitation south of the KFVS viewing area and keep us dry. However, move the storm north 100-200 miles and we could be talking a different situation. 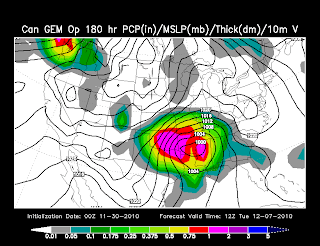 Here is the 180 hour chart from the Canadian model depicting 6am Tuesday, December 7. The Canadian model is a little warmer with the storm and has the surface low further north compared to the European model. The surface low on this chart is in a perfect position to bring heavy snow to portions of southeast Missouri and western Kentucky. However, I have one concern with this scenerio. I don't know how much cold air is already in place when the precipitation hits. This could either be a cold rain, ice, or snow. So what are your guesses? Will we see anything or no? If we do, what do you think we'll get? Rain, sleet, ice, or snow? Leave your guesses in my comment section. I continue to mention December 7-9 as to give the weather a little room in case things slow down. Everything is pointing at sometime December 7 so maybe going as far as the 9th is a little much. I am going to be out of pocket the next couple of days so I do not know how many updates I will be able to provide as I will not have the best access to weather data. If I am able to look at anything, I will try to provide updates as much as possible. I hope for snow! I also hope that the charts forecasting a system are right and we get snow! Just snow no ice or freezing rain thats no fun but lots of good snow to play in on a snow day would be awesome!